Well didn’t hot chips turn out to be a popular topic? This week, RiotACT readers got passionate about who serves up the best fried potato in Canberra. Overwhelmingly, Kingsley’s Chicken was the favourite, getting more than twice the votes of any other places suggested by readers. The next most popular was Grill’d, with a special mention going out to Watson Takeaway, which wasn’t far behind. I won’t lie, I was a bit surprised that there weren’t more votes for the good old local takeaways found in most of Canberra’s suburbs. But the people voted and this week’s hot chip showdown was between Kingsley’s and Grill’d. With eight locations only in the local region, Kingsley’s is a Canberra institution. Being a Canberra girl born and bred, eating Kingsley’s chips is always a nostalgic experience and anyone watching TV in the 90s will remember the slogan “Unbelievable chicken, awesome chips”. In 2015, they are still claiming to have the hot chip market cornered and I am inclined to agree. Kingsley’s chips hit the mark in a number of ways. Firstly, they are crinkle cut – I don’t know what magic makes the curvy sides of a fried potato taste better, but crinkle cut is a universal favourite. Secondly, their portions are generous and whoever came up with the idea to fill the bag with chips before placing it inside a slightly larger bag and throwing a few more on top was a genius. Overall, Kingsley’s chips are crunchy, salted just the right amount and will leave you wanting more. You just have to be careful not to leave them in their foil-lined bag too long – no one likes a soggy chip. Grill’d also have a strong hot chip game. With their herb seasoning and variety of dipping sauces, Grill’d serve up the perfect potato accompaniment to their delicious burgers. Their hot chips are thick cut and fried just the right amount. They also serve up sweet potato chips alongside the classic variety, which are a little bit fancy and the perfect mix of sweet and salty. With four locations across Canberra, there’s plenty of opportunity to get your mouth around a cup full of Grill’d hot chips. I’m a big fan of hot chips and in my opinion both Kingsley’s and Grill’d do a very good fried potato. 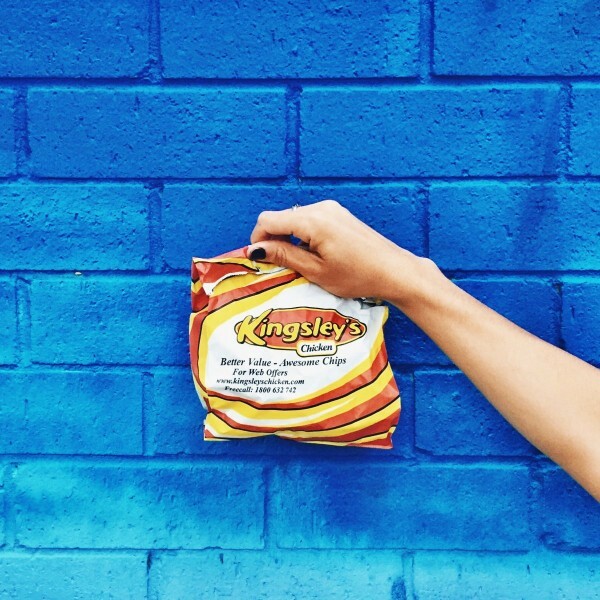 Kingsley’s makes the no frills kind of hot chips – it’s just potato deep fried and salted. 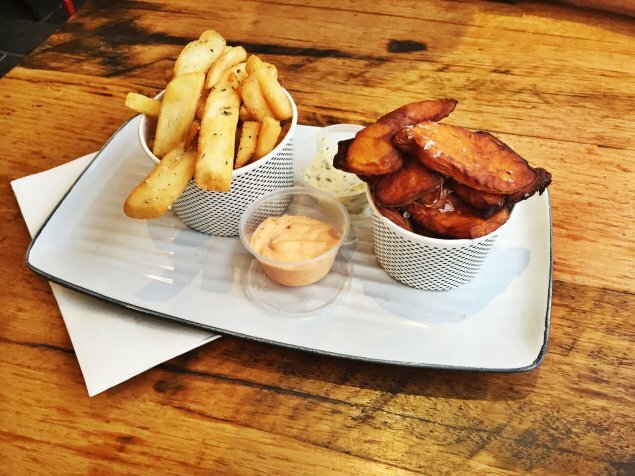 Grill’d on the other hand is all about the frills – herb seasoning, dipping sauce and maybe even some sweet potato. The Taste Off this week was pretty close, but when you strip it back to the naked chip, Kingsley’s is the clear winner. 1. More starch is extracted during rinsing. 2. More flavour is absorbed from any marinade, or from the oil. 3. The chips cook quicker. 4. There is more surface area for salt (or other flavours) to attach. Having said that, I’m not a fan of most chips simply because they are prepared elsewhere, frozen and shipped to the restaurant. Hand-cut, cooked onsite chips are my preference. Bernie’s From the Bay is my pick there. The magic is surface area, more surface area means more fat absorbed…and we all know humans like their fat. Sad that people now think that is the norm. Just as Paleo food is a caricature of what anybody would have really eaten when we were hunter gatherers. Ignoring where exactly this happened – clue probably in L.A. where all the aliens and dinosaurs seem to come from as well. The true measure of a takeaway is in the potato scallop (or potato cake depending on where you are at the time). And God bless the genius that came up with the idea of serving them on a hamburger bun with a generous coating of gravy. don’t forget the classic swiss rosti [damn lack of umlauts…]. I like a good Kingsley’s chips and gravy occassionally but this makes me sad to think that it’s the best we can do. Perhaps we will soon get Poutine here to clog those arteries? Bring on the squeaky cheese. They’ve occasionally had it on the menu at Smoque.